Sheepskin Rugs New Zealand Gifts Souvenirs. Buy your own high quality New Zealand Sheepskin Rugs from Giftsnz and let us post it to directly to you. All of the sizing's are as accurate as possible but differences are inevitable and unavoidable. All of the sheepskin rugs on this page are the colour white. Great New Zealand Souvenirs & Gifts. 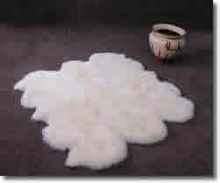 Single Sheepskin rugs are natural shaped rugs. Popular as floor rugs, seat coverings, bed underlay's, decorative use, and for your pampered pet to sleep on. 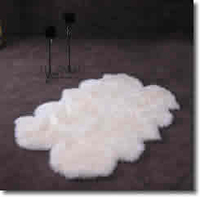 Double sheepskin rugs are natural shaped rugs. Popular as floor rugs, seat coverings, bed underlay's, decorative use, hallways and passageways, and Recreational vehicles (RV's). Quarto or quad sheepskin rugs are natural shaped rugs selected and carefully matched and sewn by our experienced craftsmen. Popular as designer floor rugs and sofa coverings in lounges and feature rooms, bed underlay's and decorative use. Sexto or six sheepskin rugs are natural shaped rugs selected and carefully matched and sewn by our experienced craftsmen. Popular as designer floor rugs and sofa coverings in lounges and feature rooms, bed underlay's and decorative use. These make a significant impact in any setting. Octo or Eight sheepskin rugs are natural shaped rugs selected and carefully matched and sewn by our experienced craftsmen, available in three colours, white, brown tip and gray tip. Popular as designer floor rugs and sofa coverings in lounges and feature rooms, bed underlay's and decorative use. These make a significant impact in any setting.